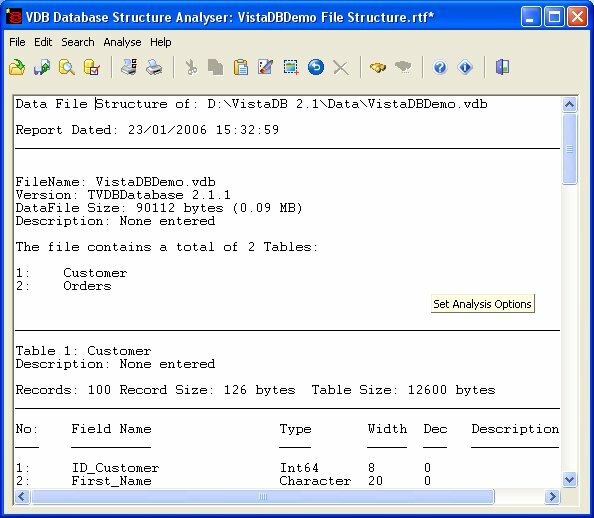 The program analyses the structure of a VDBDatabase and allows you to save the results to a file or print them out. Saved structure information can be re-loaded and re-printed, and can be modified to suit anyone's particular purposes. The resulting output is saved as an RTF file and can be further processed in Word or other applications (for example Help & Manual) for those creating documentation for their programs. It also supports cut, copy and paste operations where needed. It is a 32bit Windows application, compatible with all later Windows operating systems including Windows 98, 98SE, 2000, ME and XP.